We’ve looked at garlic, now it’s time to see what other foods you may have lying around in your kitchen that actually could work for a whole range of other medical conditions other than hunger! Take almonds, for example; how many of you will have a bag of almonds, crushed or otherwise, floating around in their kitchen cupboards? Did you know that this nut was actually one of the most powerful moisturizers in the world? 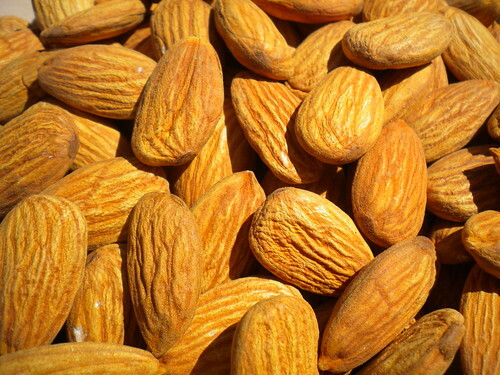 Did you also know that the humble almond contains stacks of vitamin E – we again, have already discussed the importance of vitamin E in the diet, and also what can happen if you don’t get enough of it. Of course, eating the almond is enough of a treat by itself but – the crunchy, tasty snack works perfectly in both salads and as a snack by itself, and you can even add it to cakes and candies for a real tasty delight. There’s simple so many things that you can create with this one nut. If you have had a few problems with your bowels, grab yourself a handful of nuts. There is plenty of fiber in these humble nuts and when you combine this with the water that you will want to drink after you have eaten them, as they can leave your mouth rather dry, you will be helping your digestive system along quite nicely and you may just find that something happens that might not have happened in a few days. Aside from this, what else can you use the almond for? Let’s just throw a few words in your general direction and see how impressed you are by them – antioxidants, diuretic, astringent, laxative, sedative, thermogenic…. Do we really need to say any more? In short, we will break it down for you. The laxative effect of the almond can help with things like constipation. If you make almond milk, (recipes for which you can find online) you will find that you can easily soothe a number of tummy complaints. Astringent is great for using on the skin and again, almond milk can help you – the astringent properties means that you can use a little almond milk on a cotton wool pad around the areas that you have just waxed, epilated, plucked or shaved to prevent ingrown hairs, and these properties could also help reduce shaving rash in both men and women. Although not really clinically studied in great depth, there seems to be more than a few old wives tales floating around on the topic of almonds. For example, a teaspoon of almond oil mixed with some lemon juice and a few drops of ginger juice is said to work really well at calming down a nasty cough, and can help with asthma too. Of course, if you have a nut allergy, you are probably going to want to avoid anything to do with nuts, but you will more than likely already know if you have an allergy to nuts by now. Almond and garlic oil combined are said to have very good properties especially with muscle related problems – muscle sprains are a perfect example. If legend is right, mixing equal parts of the two oils and massaging over the affected area can reduce the pain and discomfort of a muscle sprain, and could also encourage it to heal quickly. Why don’t you give it a go and let us know if it worked for you? According to other tales, using crushed down almonds (after they have been soaked in water) and mixed with a good unperfumed carrier lotion can help to brighten the complexion because of the naturally present bleaching qualities. Obviously this bleaching effect is not going to be enough to do anything major, but for an added flush in the summer heat, it could be just what you are looking for.